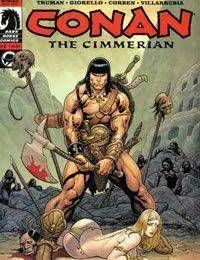 Conan the Cimmerian #0 marks a transitional period in young Conans life, as he spurns the magicians, turncoats, and legal trappings of the cities hes seen in order to return to the beloved northern frontiers of Cimmeria, where he was born and raised. It also marks a turning point in the artistic muscle that will fuel Conans adventures throughout 2008 and beyond. Writer Timothy Truman and Argentine artist Tomás Giorello are joined by renowned colorist José Villarrubia in this special issue, as they deliver their adaptation of Robert E. Howards Cimmeria poem. And whats up with Conan? He fights for his life when he crosses paths with a pack of Vanir raiders on the Cimmerian border!